There have been many cases of political leaders falling victim to assassination attempts whilst in office. The USA has seen its fair share and so have many other countries across the world but in England, only one Prime Minister has been felled by an assassin's attack and that somewhat questionable honour belong to Spencer Perceval. As some of you know, before I opened the salon I spent many a long year in the employ of the House of Commons and the tale of Perceval is one that our visitors always liked to hear! 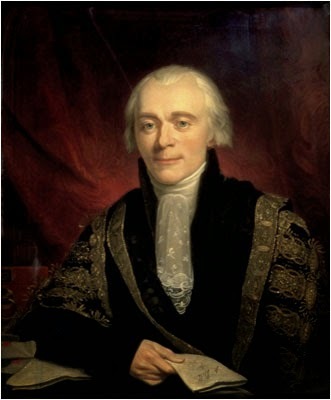 Perceval had assumed the office of Prime Minister on 4th October 1809, having previously served in a number of senior governmental positions. He survived a number of political challenges and won himself the backing of the Prince Regent, but away from the House of Commons, Perceval had made a most murderous enemy. In 1803, John Bellingham, a merchant, was working in Russia when he was maliciously accused of being a debtor. Bellingham was held in Russia for six years on a variety of charges and only freed after he made a personal petition to the Tsar. He had spent the years since his return to England engaged in fruitless efforts to gain compensation from the British government for his incarceration, believing that his country had done little to help him win his freedom. Of course, these appeals for money were all denied and Bellingham's anger quietly, furiously, festered. 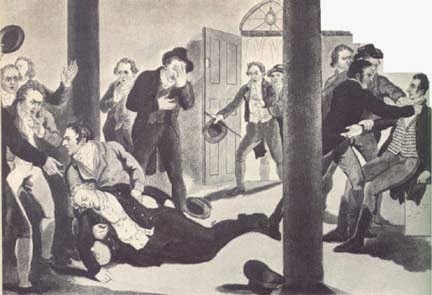 At 5.15pm on 11th May 1812, the Prime Minister entered the Commons lobby and was confronted by Bellingham, who calmly raised a pistol and shot Perceval in the chest. The unfortunate politician collapsed to the ground whilst his assassin calmly took a seat and watched the ensuing panic. Perceval was carried from the lobby into a private room and within minutes, he had succumbed to his injuries. Meanwhile, Bellingham, was apprehended and hurried from the scene of his crime amid fears that more trouble might be to come. In fact he was alone and was neither part of nor the leader of a revolutionary mob and within days he was on trial for his life. Bellingham was calm, considered and utterly convinced of the righteousness of his actions. His demeanour at the trial was perfectly pleasant and following a long and detailed description of his many grievances against the government the jury retired. Within a quarter of an hour, they decided that Bellingham was not only guilty, but of sound mind too and he was sentenced to hang. Bellingham went to the gallows on 18th May before a crowd of onlookers who did not celebrate his execution. Viewed as a man who had fallen foul of an unjust government, the public was somewhat sympathetic to his plight and a public subscription was raised for his widow and children that raised a large sum of money for their support. Just two days before Bellingham was hanged, Perceval's funeral took place at St Luke's Church, Charlton. Greatly mourned by his political colleagues, he was laid to rest in a private funeral attended by close colleagues and family. He is, so far, the first and only Prime Minister to fall victim to an assassin. Is there any truth to the story that instead of Percival, the intended victim was Granville Leveson Gower, who'd been ambassador in St. Petersburg? Indeed so; at his trial, Bellingham said, "Had I been so fortunate as to have met Lord Leveson Gower instead of that truly amiable and highly lamented individual, Mr Perceval, he is the man who should have received the ball!'. Thank you Catherine. This is not an unfamiliar scenario for assassination. The festering grudge (real or imagined ) against the government. Very true; it seems like an all too common motive! Most interested to read this as Spencer Perceval came from Northampton, I believe, where I am from. Aside from the odd indie rock band and the odd pair of shoes, about the town's only claim to fame! The shoe-making capital of the UK! Did anyone raise money for the family of Perceval? A younger son and honest politician he had little money but quite a few children. More sympathy seems to have been felt for Bellingham than for Perceval . I can believe that Lord Granville Leveson Gower had turned a deaf ear to Bellingham. I have little sympathy for Bellingham . That is saved for Perceval's wife and children .